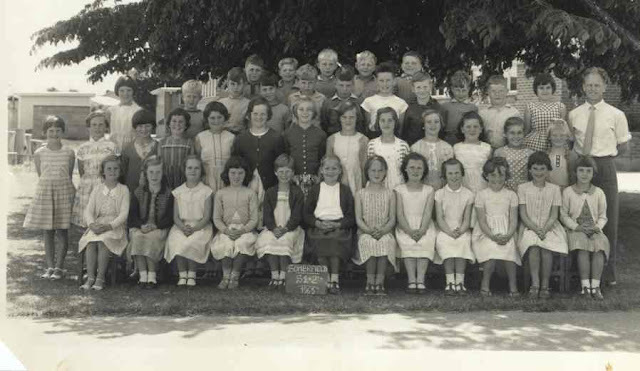 A Kiwi at the camera: School life from the past 1963 to 1972 - recollections of Primary and Secondary school. 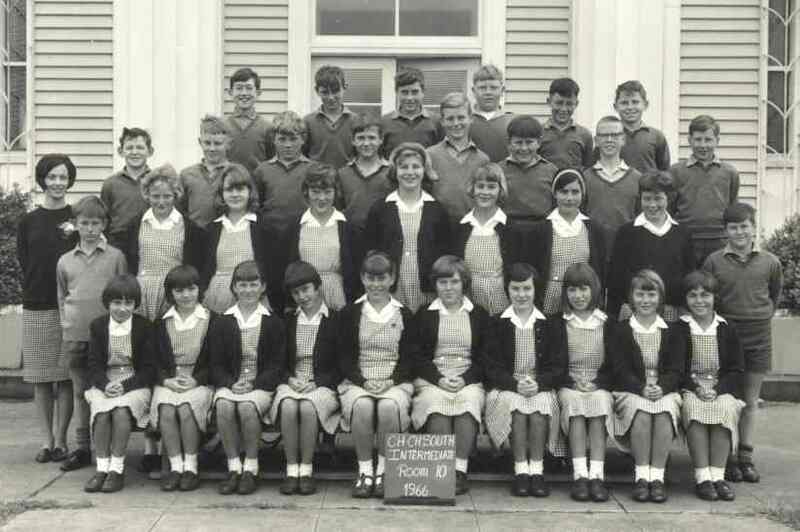 School life from the past 1963 to 1972 - recollections of Primary and Secondary school. School was a short walk (ten minutes - according to Google - it seemed longer then) from my home in Roker Street which I did with friends via a short cut through the Sydenham Cemetery and Somerfield Park. 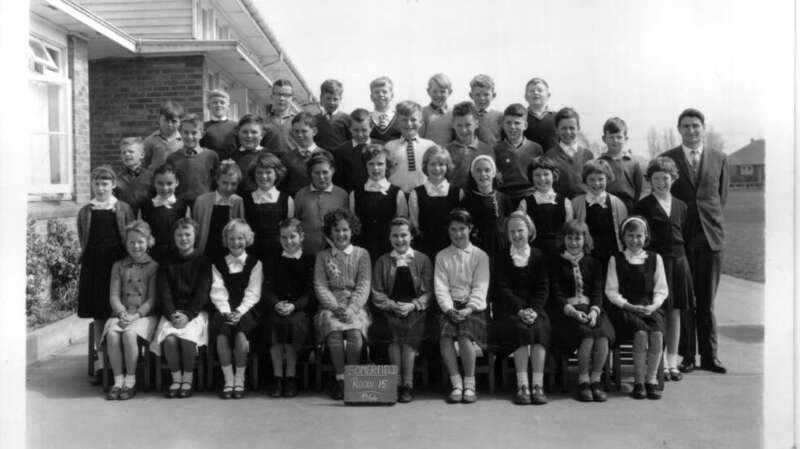 Class sizes were large - 41 in the photo below which means larger than that taking account of absences. Today only the infant block remains as I remember it. Many children came by bicycle and there was a very large bike shed off Studholme Street; today that whole area is occupied by car parking spaces. Back then not every family owned a car and certainly using it to transport children to school would have been seen as a frivolous activity. I don't recall any "stranger danger " issues but we did move around in number. Fortunately the beautiful trees which provided shade in Christchurch's blistering north-west days remain on the north-eastern and north-western boundaries. I was a quiet, introverted child, happy in my own space, happy to work on projects on my own something which has not changed through my life and indeed identified much later as a preferred working style in workplace personalty testing (no surprises there). This however did not stop me getting strapped and caned at primary school as corporal punishment was the norm not the exception back then. I don't imagine this did anything for my natural shyness and preference to remain invisible. I don't have any photos older than Standard three (below) but I started at the school aged 5. I did have Mr Burrows as my Standard one teacher - he was a champion axeman and used the strap, a lot. One thing I note is that back then there did not seem to be any problem attracting male teachers into primary school in the way there is now. I don't reminder anything about Mr Sharp except he was an authoritarian caner and strap user and he might have played either the trumpet or trombone. 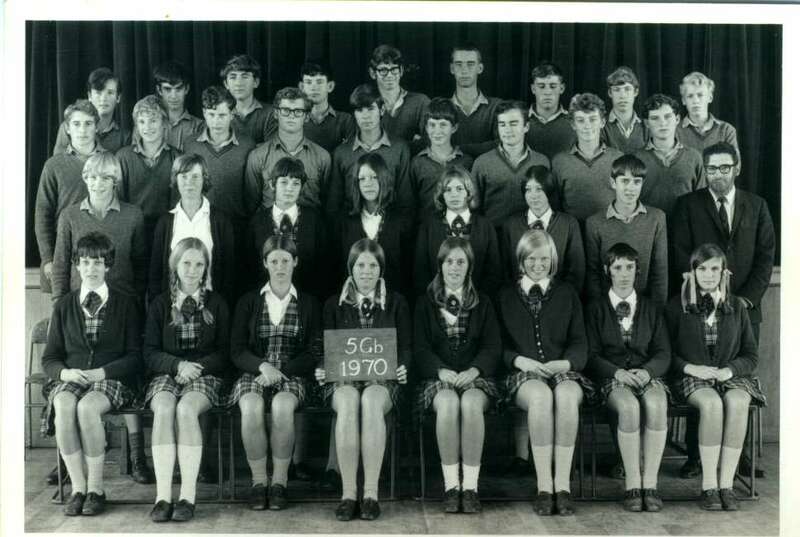 I'm not sure why but I can still remember many of the names of people in this picture, not sure why I haven't seen any of them since I left Christchurch in 1966. Of course this year 2019 most of us would be getting our Gold cards (free public transport) and pension. I'm not sure why it is that there seem to be uniforms in this picture and not the others . Mr Common was handy with the ruler and would throw chalk or dusters at children who were distracted. He also tried to make left handed children write with their right, although I think that was accepted practice from discussing this with a few of my friends. I know a couple who ended up ambidextrous. What I recall of Mr Bell was he was tall, a good teacher and universally liked by both pupils , parents and fellow teachers. He was a representative softball player who coached the school team - I was the pitcher and also pretty much the only time I was any good at a team sport. He even put on softball practice for those who had left school in Somerfield Park. He passed away around 2012 and there is a seat in Barrington Park with his name on it. I think I might have been the traffic warden, not that I can remember what that entailed. I only had one year at Christchurch South, the only enjoyable parts being the wood work and metal work classes. 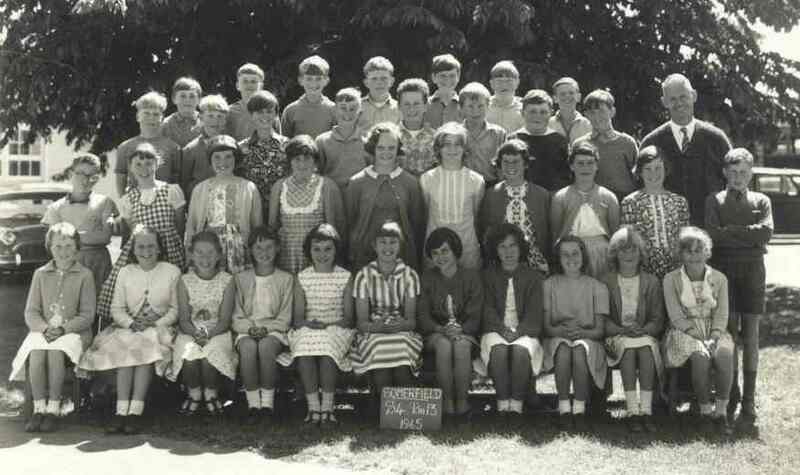 Some of the kids from my Somerfield School were in this class so I sat next to Deborah Richardson and Ann Drake the latter of whom remains a life long friend. In my forties I was diagnosed as a moderate dyslexic which might account for some of the troubles I had at school since I was (and still am) hopeless at spelling this I suspect was thought of by teachers as laziness or stupidity. I did not like my year at Christchurch South and I disliked Mrs Mee, I'm pretty sure it was mutual. There was the metal work teacher Mr Van Duran the kids liked him, in contrast to Mr Barson the woodwork teacher who was very loose with his use of the "wooden spoon" and smoked continuously including in class. I rode to school on my dads old bike rain or shine, freezing or sunny. I think my highlights were that one of the boys parents owned an ice-cream shop in the area and that we used to cut through a back entrance onto Strickland Street and get potato fritters (1penny each) from a takeaway shop there - heaven. I can't see any evidence that either business still exists. A big thanks to Terry Toner who was in a number of my primary and intermediate classes, I can't remember how we resetablished contact after almost fifty years but he has helped fill in a lot of the detail that escaped me. Check out his Tuesday morning music show on Radio Southland Schedule. The school looks largely to have been rebuilt since I was there. Redwood School opened in 1966. 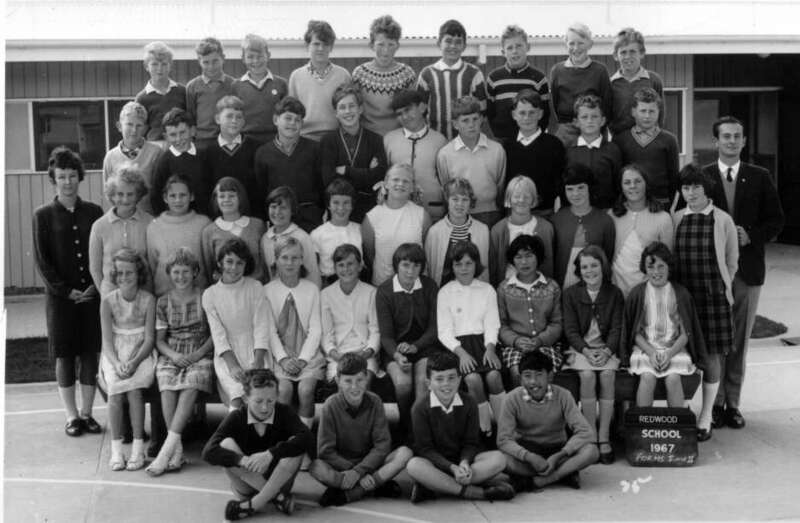 Initially I was in a very large class but sometime in the year the class was split with form two located in a prefab (temporary building) in the playing field. Mr Pinker was exceptionally gifted as a teacher, firm but fair and someone who had grown up on a farm. I am fairly sure he later became a priest, he would have made a good one. It was here I met my friend Jim Ertel. 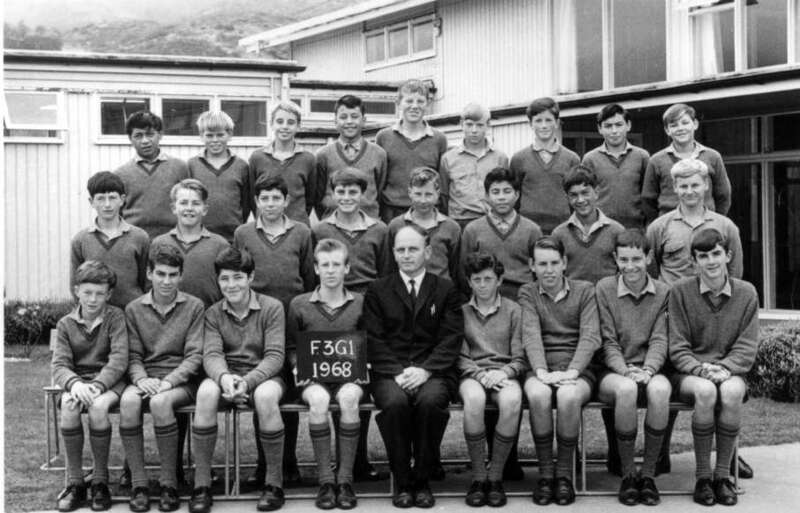 When I started at Redwood (having moved up from Christchurch) the then Principal Con Coffey sat me down next to this blond haired kid and said "this is Jim he will look after you" - perhaps we should give more credit to the insight teachers gain in quickly accessing children's personalities and likely matches. Much later, purely by chance, I found myself flatting in Wellington City with one of the form one girls - Raewyn Brown. I also met Malcom MacRae here, he, I Jim and a friend from high school became firm friends through our love for things mechanical. As I remember the one thing that characterised the form two's were their smarts with most of the girls especially being very strong academically. Unlike Christchurch I don't recall any corporal punishment at Redwood, I was certainly not on the receiving end although I do remember Mr Coffey as a principal who wouldn't take any crap. Tawa College was opened in 1961 and the Principal the whole time I was there was Eric Flaws. It was a big school even by the standards of the day, around 1200 pupils. Eric Flaws (or Fanny as we called him) ran a tight ship and with that a return to the corporal punishment of the Christchurch days. However I was not on the receiving end and I'm pretty sure it was reserved for repeat trouble makers rather than a kids who just could not learn to spell or the times tables. Tawa College (Eric Flaws) was rugby mad and being in the First "15" meant more than most everything else . It did produce Murray Mexted the son of the local service station owner (and former all black) who went on to be one of the great All Blacks - a nice person as far as I can recall (he was in some of my classes) and an especially gifted sportsman. I either walked (25mins) biked or in later years got a ride on the back of other peoples motorbikes to school. 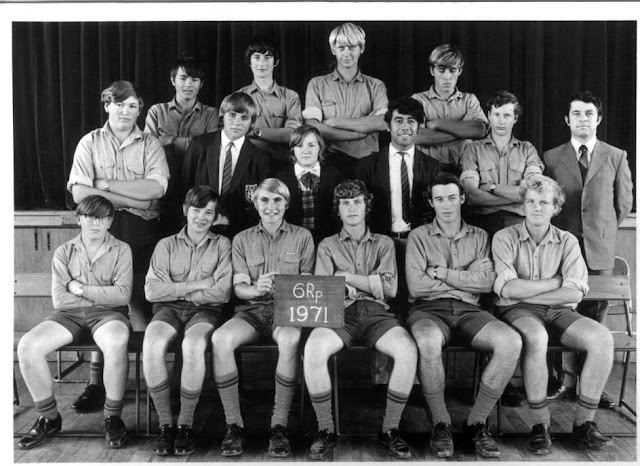 Although I later found out that Jim was the target of bullying at Tawa college I did not find myself on the receiving end. This was partly because I hung out with group of older boys one of whom Peter Hickson was my tennis and fishing buddy out of school and partly because I had two friends Murray Biggs and Richard Adams who were scuba divers muscled to the extent that nobody would mess with them. Murray certainly had a reputation for taking no prisoners. Peter went on to be the Tawa Vet for his whole career. As I'd made a decision to go for engineering or architecture I convinced my parents to let me head for the only classes that covered engineering as well as technical drawing. However as two of us scooped all the prizes at the end of the year we were both forced out of this class in form four. Having said that I learnt a vast amount of useful practical knowledge that would come in very handy in later study, when I was renovating the house and generally as a home handyman. One thing I remember about the "G" boys who were generally looked down on by the "Language" stream was that they looked after their own. I have no doubt that many of these boys who were inclined to the practical have gone on to be the owners of very profitable plumbing, electrical and building business of today. Mrs Aburn (Nancy) was my form teacher in the 4th form at Tawa College and I was also in her maths class. I think I got prize for Maths in her class. As far as teachers go Nancy had that "something" which made her stand out above the rest for me and I think the others who had the good fortune to be in her classes. Incredibly respected and liked I later occasionally played badminton with her as an old boy - she was a fierce player and a wiz close to the net. I think if I had managed to keep her as my maths teacher right through high school it would have made my study life a lot easier when I was doing engineering later. She served for over 40 years at Tawa College and I would suggest her impact on the youth she taught would be beyond measure. By far my best teacher ever. 4C2 was a stream oriented more towards business and much of what was taught should really be mainstream for everyone as the concepts on accounting, banking, business management, business writing etc never left me and that basic knowledge really helped me in the workplace. 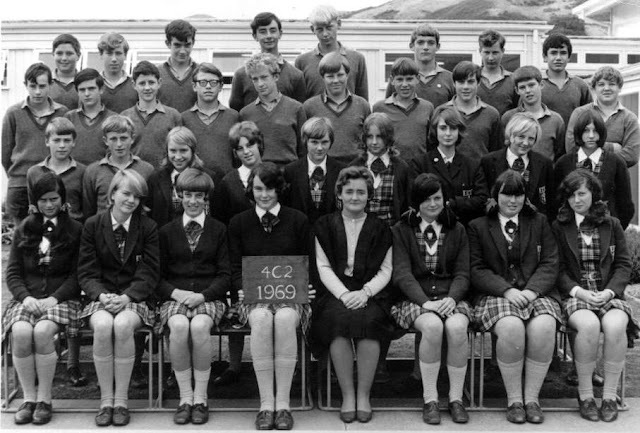 After the fourth form they stopped dividing pupils into dedicated streams and it became more a subject choice hence the form classes being named after the form teacher. Back then the 5th form was the year of School Certificate an external examination which needed to be passed in order to get into the sixth form. I remember Mr Greenback as a fairly affable type and my Geography teacher. Phil Lumley was in this class and although I think I might have known him previously we became firm friends him becoming part of our pack of Four car and bike fanatics. He occasionally ferrying me to school on his many and varied motorcycles which for the most part he had rebuild from boxes of bits. Phil also introduced me to music, he was building stereos and speakers at home (aged 15). I passed School Certificate with good marks expect for english which I failed probably because my spelling was so bad. I think you lost a mark for each spelling mistake - pretty much destined to fail from the outset. I really don't remember Mr Roper or what if any classes I was in with him and there is certainly a very odd gender imbalance in this form class. Malcom Macrae was in my form class, we had been at Redwood together. He and I are friends today although I did loose touch for a long while when I moved away from Wellington in the pre-email/cell phone expensive toll call era. The sixth form then was marked by the need to pass UE or University Entrance which could either be by internal assessment (accredited) or external exam. The most notable point being that no matter how brilliant you were at everything else you had to pass "english". A lot of otherwise very able students were forced to fall by the wayside as a result, fortunately I wasn't one of them. It did however take a herculean effort to get myself over the line on the internal exams and get myself accredited. At that level I had some really good teachers perhaps the most notable being Mr Mathews my Physics teacher, he lead by example, had high standards and on receiving 40 assignments on a Friday would have the marked carefully and returned on the Monday. Firm but fair and very very respected, he would have done well outside the school system as a technically able people manger. This was in complete contrast to Bruce Murray who was in international cricketer and so distracted externally that assignments were either not returned or returned weeks/months later. He was disliked by many and someone set fire to his home mail box - a step too far. Ironically he went on to later become the Principal. The seventh form was aimed at preparing for further study and in particular university. There were only three seventh form classes and packed with incredibly bright kids, I felt an imposter. It was a struggle for me and I found much in the way of external distraction as both Jim, Malcom and Phil has left high school. I didn't really work as hard as I should have, assuming failure and in the end only missed bursary by five marks something which still bugs me. Of course the irony was that the "Bursary" was virtually worthless in dollar terms for university and I more than covered it off by working over Christmas as a Postie before heading for a full-time year at Wellington Polytech. On the upside the seventh form was mufti, you had the power of god over the rest of the school and the hours were very relaxed. Additionally the teachers called you either "first name' or "Mr Last Name" and it was acceptable for some at least to call them by their first name. At the end of the day we were only a few years different in age and maturity to some of the teachers. I had Mr Edgecomb for English, the first time I ever enjoyed English as a subject at school. It was far more interesting and I still remember doing "The Clockwork Orange" as a set text for study - very hip. It certainly got me over the 6th form horror of dissecting one paragraph of Shakespeare to death. 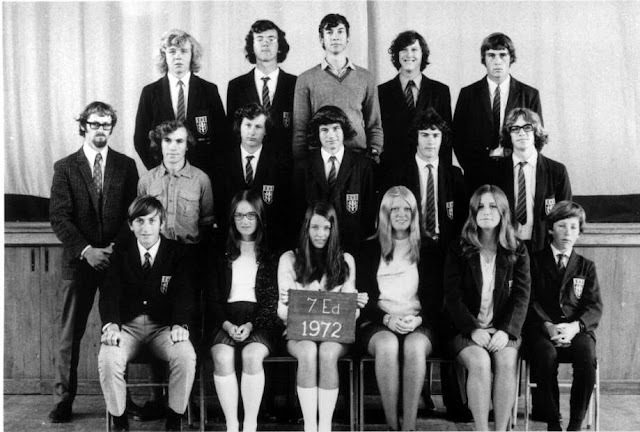 Prior to the seventh form I regarded school as torture but I really liked my seventh form year and essentially all study that followed.